Toss all ingredients in a large bowl or tub. Using a hand mixer, mix ingredients until meat and vegetables are broken up and the mixture is the consistency of lumpy cookie dough. Add dry rolled oats as needed to make a stiff dough. Press into a sheet pan or brownie pan about 1 inch thick. Bake at 375 degrees for 1 hour or until center is firm to touch. Let cool and cut into large bars (8 bars to a full-size sheet pan). 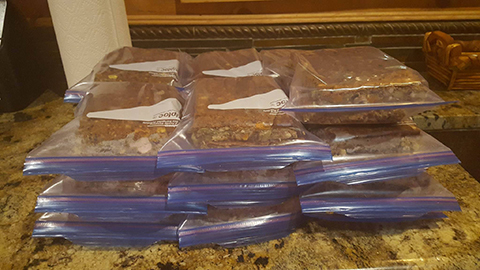 Wrap bars in foil or Ziploc freezer bags and freeze. To serve, thaw a bar and cut it into 1-inch squares or break into bite-size pieces. Serving size: four 1-inch squares. Store left-over bar in refrigerator. This makes 2 large sheet pans. May also bake in mini muffin tins at 375 degrees for 30-45 minutes. 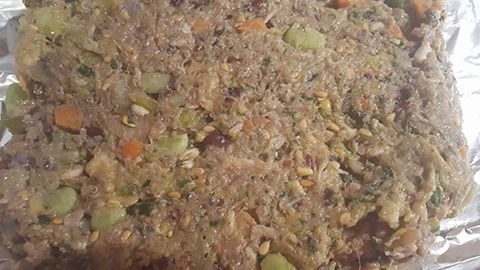 This recipe supplies many of the important nutritional elements that our monkeys need. In the wild, monkeys eat insects, small lizards, birds, eggs and even small rodents. Even the vegetation that a wild-living monkey consumes is much higher in protein than the vegetables that we have available to us in our grocery stores. The primate diet should consist of approximately 25% protein for most species. These homemade biscuits provide protein in the form of chicken, whole grains, seeds, nuts, eggs and beans. Quinoa, pronounced keen-wah, is an amazing grain that is loaded with protein, even more protein than some meats! Fiber in the diet is essential for digestion and elimination of waste. In the wild, monkeys eat fibrous plant material, bark, twigs and even dirt. There are two types of fiber; soluble and insoluble. Soluble fiber acts as a sponge in the intestinal tract, absorbing excess water and adding bulk to the stool. Insoluble fiber acts as a broom, pushing food through the intestines and waste out. A thin, pudding-like stool is an indication that the monkey’s diet is deficient in fiber. 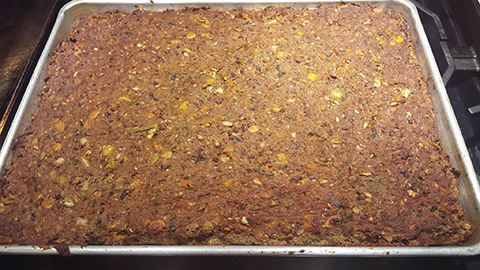 This recipe is loaded with good fiber in the forms of vegetables, whole grains, flax seed, wheat germ or oat bran, psyllium husk, pumpkin, apple, nuts and beans. Omega-3 fatty acids are essential for healthy skin, hair, eyes, brain and heart. Good sources of Omega-3 fatty acids in this biscuit recipe are ground flax seed, flax seed oil, nuts and seeds. Carbohydrates are to metabolism what fuel is to an engine. They are consumed by the body or “burned” to produce energy. There are two types of carbohydrates; simple and complex. Simple carbohydrates are the “bad” carbs such as sugar and sugary foods, bakery items, and starchy foods such as potatoes, rice and pasta. Simple carbs metabolize quickly and produce a burst of energy, followed by a sharp drop in activity. These rapidly changing energy levels are accompanied by a rapid rise and a steep drop in blood glucose. Rapid fluctuations in blood sugar levels like this contribute to the development of insulin resistance and ultimately diabetes in primates. Complex carbohydrates are “good” carbs such as whole grain brain, whole grain pasta and cereal, brown rice, whole grains and beans. These foods metabolize more slowly and produce steady, longer lasting energy as well as stable blood sugar levels. If you think of food as fuel, simple carbs are like jet fuel that burns hot and fast but runs out quickly; complex carbs are like a log on a campfire, smoldering slow and steady. 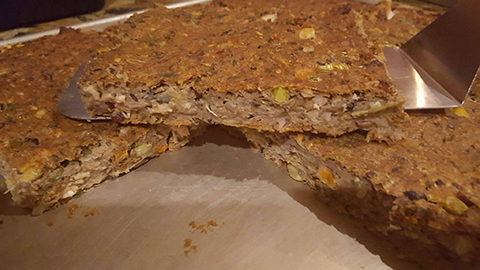 The vegetables, whole grains, wheat germ, oat bran, pumpkin, apple and beans make this homemade biscuit recipe a great complex carbohydrate food. Janice Metzger has over 10 years of capuchin experience. She has raised 5 capuchins and rescued 2. She also runs a site called MunkyBunz where she sells cloth diapers and hammocks that will last a lifetime!